Clipstone Services also run a small fabrication service making industrial gates, bollards and industrial fencing along with bespoke domestic gates and fencing, all with on site installation if required. 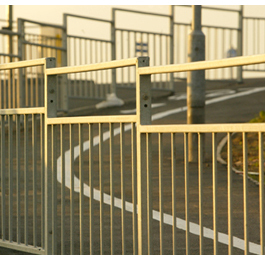 Our Nottingham fabrication team have a vast amount of experience in the fence and gate fabrication industry. What ever your fencing requirements, Clipstone Services will deliver. Security Fencing: Whatever your premises, we have the fencing system to suit your security needs with a professional installation service for; Steel Fencing, Palisade Fencing, Weld Mesh Fence. Gates: Whether its sturdy gates for your drive or car park, decorative gates for your commercial garden, or protection for your business premises, Clipstone Services supply a comprehensive range of gates, varying in style and cost, offering a solution for everyone regardless of budget. Bollards: High Security Bollards are the answer to the most demanding requirements of access control and impact resistance. Clipstone Services Ltd will asses your individual requirements, before delivering the bollards and installing them on site. Clipstone Services Ltd is built on customer recommendation, providing quality workmanship and excellent fence installation services. We are committed to our customer�s satisfaction from job quotation to job completion. Years of fencing experience makes our professional team experts on your commercial fencing needs. We will help you select the best fencing products to suit your particular application, knowing that every fencing and gate installation job is different.